New Directions Publishing Corporation, 9780811214605, 116pp. The drama takes it form from the shifting scenes of memory, and Williams's surrogate self invites us to focus, in turn, on the various inhabitants or his dilapidated rooming house in the Vieux Carre: the comically desperate landlady, Mrs. Wire; Jane, a properly brought-up young woman from New York making at last grab at pleasure with Tye, the vulgar but appealing strip-joint barker; two decayed gentlewomen politely starving in the garret; and the dying painter Nightingale, who tries to teach the young writer something about love--both of the body and of the heart. This is a play about the education of the artist, and education in loneliness and despair, in giving and not giving, but most of all in seeing, hearing, feeling, and learning that "writers are shameless spies," who pay dearly for their knowledge and who cannot forget. 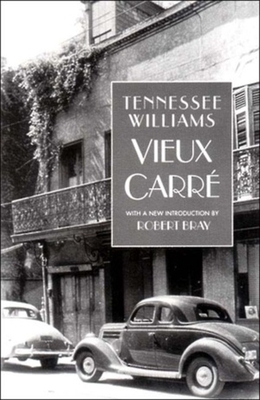 Building on two decades of Williams scholarship since Vieux Carre was originally published, Robert Bray, editor of The Tennessee Williams Annual Review, has provided a new introduction for this edition, giving the most authoritative account yet of its background and genesis.